Prendergast is excited at the prospect of being appointed a city official. He visits City Hall in early October and introduces himself to the current corporation counsel, named Kraus, explaining that he is Kraus’s successor. Kraus smiles and introduces Prendergast to his staff as his “successor.” Everyone smiles. Prendergast begins to sense that something is wrong. When Kraus asks Prendergast when he will be replaced, Prendergast replies that he’s in no hurry. Privately, though, Prendergast is surprised, and doesn’t like the way Kraus talks to him. Prendergast becomes increasingly dangerous as he senses that his desire to be corporation counsel won’t be honored. From his perspective, he thinks that Harrison has betrayed his trust and cheated him out of a position he deserves (of course he doesn’t realize that his role in Harrison’s campaign was in fact so small that Harrison has no idea who Prendergast is). This makes Prendergast a threat to Harrison, despite the Mayor’s famous sympathy to the working class. Arn, Jackson. "The Devil in the White City Part 3, Chapter 18: Prendergast." LitCharts. LitCharts LLC, 1 Jul 2015. Web. 25 Apr 2019. Arn, Jackson. "The Devil in the White City Part 3, Chapter 18: Prendergast." LitCharts LLC, July 1, 2015. 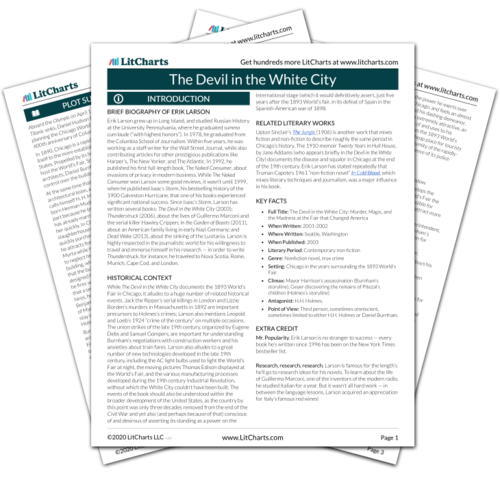 Retrieved April 25, 2019. https://www.litcharts.com/lit/the-devil-in-the-white-city/part-3-chapter-18-prendergast.